Social media is the virtual hangout joint of the internet and that is where most of the engagement and interaction of the internet takes place. Since marketing is all about positioning a product in places where you are likely to get better visibility, social media also Doubles up has an amazing platform for Digital Marketing. However, it is to be understood that each platform of social media needs to be treated differently. This is where the expertise of the social media marketing team of Claritaz becomes vital. Our team of social media experts takes care to analyze your product at your service, the emotions attached to it and the different ways to market it. We specialize in all kinds of social media platforms including but not limited to Facebook, Twitter, LinkedIn, YouTube, Instagram, Pinterest and any other social media platform that might creep in in the future! Content forms the backbone of any digital marketing and social media is not an exception. Our content writing team takes care to create content that is best suited for that particular social media platform and also takes into consideration, the mindset of people when they browse that social media website. After all, a person looking at Facebook is not the same even if the same person was to look at LinkedIn! The power of social media is manifested based in the advertising options that it provides. Whatever data we give to social media platforms at the point of our account creation and the pattern of our content posting on social media determines your interest which would primarily be used as a demographic targeting data-point to serve ads. Combining this targeting options with the different kinds of goals like website visits or lead generation can transform social media into one of the most powerful advertising platforms, both for lead generation and branding! Social media follows a certain calendar that holds good for either for a year or a week. There are certain events that might not be considered great when it comes to the outside world but have quite the popularity and viral pattern when it comes to social media. We take care to capitalize all those events, infuse them with the product or the service that you have without compromising on the core values and philosophy of your organization and presented to a suitable audience on social media. 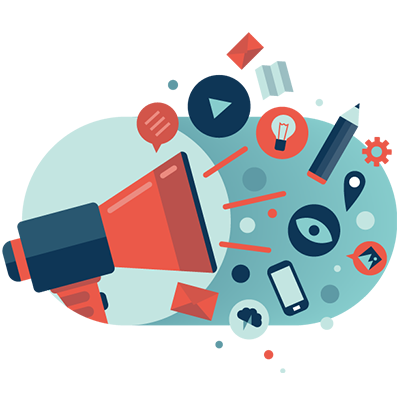 In today's world when there is a constant need for reach and recognition, digital marketing is the answer! SEO and other digital marketing services give you the limelight of reach and branding. Engagement is one of the most important requirements of social media that might not always be achieved on a website. This enables brands to communicate with the users at a grassroot-level. The engagement of a particular post can be boosted for a specific set of an audience on all social media platforms. This one takes the website traffic to another level of Awesomeness. The use of the ad doesn't it just end with bringing people to the website but stays on until the conversion happens. The conversion could either be the filling of a form or completing A purchase on an eCommerce platform. Website traffic plays a vital role in measuring the intensity of a brand. Social media, with its enormous user base and the magic of targeting options, can bring about visitors to the website if the ads are crafted in such a way to pinch the ego or address the need of one particular target segment. The goodness of social media can be best felt in the lead generation ads. In businesses like real estate or interior design, leads are more important than website visits and these ads provide a platform for prospective customers to submit their lead data without leaving the social media platform. It is preferred by a lot of customers and businesses alike because the business happens without the customer leaving the social media platform and the lead data is pre-filled with the information that is available on that particular profile. Social media management can become a vital part of your business ecosystem if done right with your customers in mind. Claritas presents you with both the empathy to understand your customers and the expertise it takes to advertise to them in a lucrative fashion. Count On Us for your complete, balanced and Holistic social media Management Services!